I'm in my mid-forties and hear it all the time. "Wow, you're a grandmother? You're how old? You look good for your age!" Most of the time I smile and say thank you. I admit that at first, this type of compliment doesn't always feel like a dis to me. I know my family has good genes and none of us quite look like our age. Even my husbands family looks so young you wouldn't believe how old his sisters actually are. However, we have to be more aware of the backhanded compliments we give others. The sad truth is 82% of women have heard this type of compliment in the past year and it can be hurtful to some! If I'm honest I know I've said it myself when it came to seeing very old women who were in the 80's or 90's look like they were in their 50's. Mostly because everyone else said it so I didn't think twice about it. But telling any woman she looks good for her age is a backhanded compliment for sure. Why not just say "Wow, you look great", and leave it at that. The fact of the matter is, as women age they are more apt to hear "for your age" attached to a compliment and it can negatively affect a woman's confidence. See how Actress Thandie Newton is dealing with the power of these words personally. This buzzer will help me challenge those words that are a buzzkill. 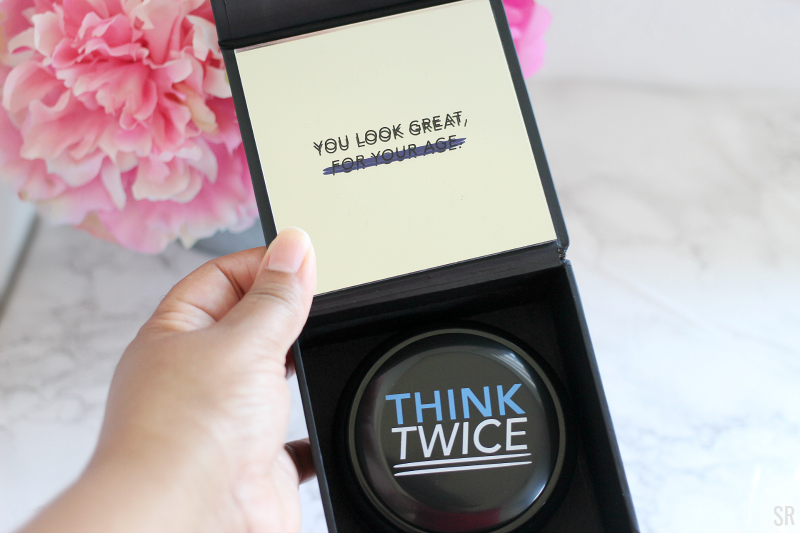 I'm teaming up with RoC skincare to help remind us all that every woman is beautiful, period. No matter what her age. So won't you join me? Let's all think twice before saying #foryourage again. Do people ever say you look good for your age? How does it make you feel? *Thanks to RoC Skincare for sending me this buzzer. I totally agree! Yes I hear this often and I would love to just hear ya look great not with for your age attached to it! Yes, yes! I hear that all the time and do my best to not say things like that at all. I totally agree that every woman is beautiful, and I count it as a blessing to look and feel younger then my age! I always get that I look so young and it’s never bothered me but after thinking about it, you definitely can see how it’s a backhanded compliment and we all look great no matter what! Going to try to do better with making sure I use “for your age” less! I always tell someone they good good period. The age doesn’t matter to me. I haven’t gotten the “for your age” comments yet but I have a response ready. I try to be mindful of things I say all around so people aren’t offended because I know how it feels to be offended by a back hand compliment. So i know someone who just turned 50 and i had to take back saying she looks good for 50. I think I told her she is changing the wave of beauty and I admire her she is doing it better than women my age! Some people just expect you to look a certain way at a certain age. But not everyone ages the same way. I think it's all about the misconception. Great post. Thanks for sharing! Amen to that! People need to think before they speak! I haven't heard that yet, but I know it's coming. However, I catch myself saying it when it comes to celebrities.